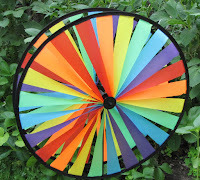 The patent "wheel of fortune"
This posting is a continuation of a previous LawPundit posting on Mouse Trap Economics. MR. EARNEST: "Les Earnest, speaking for myself. When I entered the field as a programmer in 1954 there were only about a hundred of us in the whole world, and each of us was turning out thousands of inventions each year, or maybe it was hundreds depending on your standards, but a lot. Software was given the same kinds of protection as other documentation, namely copyright and trade secret. It was certainly a good thing that there were no software patents because my colleagues and I could have papered over the field and retired for 17 years or so to collect royalties. Since patents didn't exist, we kept working and had quite a good time doing it, sharing ideas and standing on each other's shoulders to see how high we could reach. In 1956 I went to MIT to help design the Sage Air Defense System, it was a technological marvel full of inventions, both hardware and software. It was the first real_time computer system and depended on the large software system that was cooperatively written by many people. That was the first such system. This project helped transfer a lot of technology from MIT to IBM, but almost nothing was patented. Dozens of Sage systems were eventually deployed around the country, each with a vacuum tube computer that covered a floor area about the size of a football field and an air conditioning system to match. It is fortunate that this power, that the Soviet Union, never attacked the U.S. in that era, because the marvelous technology in Sage had several Achilles' heels that would have caused it to fail catastrophically under attack. However, those short comings were kept well hidden from Congress and the public, and as a result the so_called command control communications technology became a major growth industry for the military industrial complex. The most recent example of that line of development being the grossly defective Star Wars system, but that's another story. Beginning in 1959 I developed the first pen_based computer system that reliably recognized cursive writing. I believe that it was more reliable than the 1993 version of Apple's Newton. But the idea of getting a patent on such a thing never occurred to me or my colleagues. It wouldn't have done much good anyway because the computer on which it ran filled a rather large room, and the 17_year life of the patent would have expired before small portable computers became available. In order to cope with a personal shortcoming, I developed the first spelling checker in 1966. I didn't think that was much of an invention and was rather surprised when many other organizations took copies. And, of course, nobody patented things like that. When John McCarthy and I organized the Stanford Artificial Intelligence laboratory, and I served as its executive officer for 15 years, there was a great deal of innovation that came out of there, including the first interactive computer_aided design system for computers and other electronic devices, early robotics and speech recognition systems, the software invention that became the heart of the Yamaha music synthesizer, document compilation and printing technologies that later came to be called desktop publishing. The Sun workstation was invented there. And the guy who invented public key cryptography was in our lab. Few of these inventions were patented in the early period, but we later began to file for such coverage. The pace of innovation I note has necessarily slowed over time as the technology matures, but concurrently, of course, the amount of patent protection has increased. I suspect that these changes are connected. Yesterday in this forum, my friend Paul Heckle said that software patents stimulate new businesses. I'm afraid that Paul has that backwards. In fact, new businesses stimulate software patents. Venture capitalists want the comfort of patents on products that are being brought into the market even though know_how is far more important in most cases. In 1980 I co_founded Imagen Corporation, which developed and manufactured the first commercial desktop publishing systems based on laser printers. We filed for software patents to try to appease the venture capitalists, even though it was not actually important to our business, I believe. Of course, they didn't understand and the lawyers were happy to take our money. Based on my experiences, I also joined the League for Programming Freedom to help resist the patent conspiracy and I later served for a time on its board of directors. In summary, for many years there has been a great deal of innovation, there was a great deal of innovation in the computer software field with no patents, under the quote, stimulation of software patents the pace now seems to have slowed. I believe that there may be a connection, not only because of the time that must be devoted to covering and deciding what to cover and filing a patent application, but also because patents are owned by other organizations, many of them in fact based on prior art, and constitute a mine field that must be carefully navigated. I recommend a return to the good old days when success depended on moving faster than the other guys rather than trying to catch them in a trap. COMMISSIONER LEHMAN: Thank you very much, Mr. Earnest.